It's entirely possible that Staci and I were delirious by the time we arrived in Barcelona. Running through Heathrow trying to catch a short connection will do that to a person. By the time we landed in Spain, it was 9 pm and we hadn't eaten since our early-morning, goodbye pastry binge in Paris at Du Pain et Des Idées. 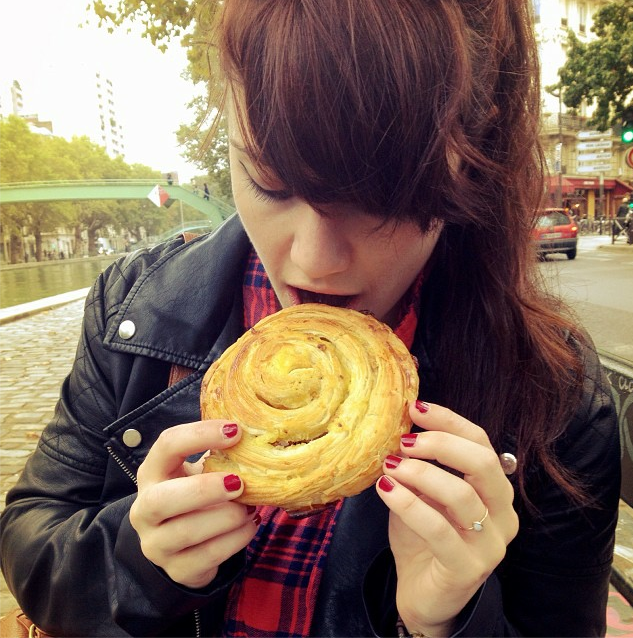 Don't believe those other travel bloggers -- eating a bag of pastries before boarding a plane is never a bad idea. Staci told me it looked like I was about to "do bad things to this pastry." She wasn't wrong. Unfortunately, we had more important things to do than wash our butts. Before our trip, I'd heard about a tiny hole-in-the-wall place about a block from us, courtesy of Anthony Bourdain. The area wasn't well lit and had a slight shady vibe to it, but since we're badass chicks from Baltimore (read: extra hungry ladies), we kept our eyes on the prize and headed toward the food, undaunted. From the moment we opened the door and saw the walls lined with bottles of wine we knew Quimet y Quimet was going to be our kind of place. We walked in, smelling airplane fresh and looking totally disoriented, but were immediately embraced by the staff. Since they forgo the tradition chair and table situation in favor of a counter, tall tables and no seats, we weren't sure what to do or where to start. They patiently guided us silly Americans through the menu and suggested a variety of options. But seeing how we'd gone more than 10 hours without eating (a new record for us?) we basically just ordered the whole menu. It seemed like the right thing to do. This turned out to be the best decision we made all trip. Instead of the overpriced, half-portion appetizers and mini bowls of olives that I'd been served in NYC tapas bars, this place offered up architectural masterpieces; huge hunks of toasted bread layered with the freshest fish, meats, cheeses, and vegetables. Oh, and did I mention the caviar? Yeah, they're not shy about piling on the fish eggs. I'm not usually a huge fan of those salty suckers (mostly for texture reasons) but I could eat the caviar at Quimet y Quimet by the spoonful. Even the honey, olive oils, and glazes they used were far better than anything I'd tasted in the States. Is ordering everything an option? Unfortunately, our dessert choices were limited thanks to my nut allergy, so we went with sugar cookies and this totally strange, totally awesome fruit and liquor dish. I wanna say the fruit was somehow related to a peach (though we'll never know for sure since we're equally ignorant of Catalan and botany) and the entire thing seemed to be carbonated. At some point the staff just started bringing out random things we didn't even order. Probably because our reactions to each dish were the funniest things they'd seen all day. This meal ignited our obsession with sangria in Barcelona. The fantastic (and very potent) concoction tasted more like fresh fruit punch than the Two-Buck Chuck tossed with brandy and a diced apple that I was used to back home. I think this goes without saying, but we drank A LOT of this. Bellies full, heads floating, we blissfully waddled back to our hotel. So how exactly did Bourdain ruin my meals in Spain? Let me explain. Quimet y Quimet set the bar high. Like really high. Everything about this place was on point -- the food, the drinks, the ambiance, the staff, and the price (I'm not joking -- this place was dirt cheap). We figured that every meal in Barcelona would be similar to this one. We proclaimed that night that Barcelona was "totally beating Paris in food" -- that is literally what we said, because sangria. For the rest of the trip, we compared every meal to this one. Nothing even came close -- and we went to some highly recommended places. We're talking upwards of four Yelp stars, y'all! We just couldn't get Quimet y Quimet out of our heads, and honestly, I still can't. Bourdain may have ruined all future meals for me. It's too early to say. I can only hope that his U.K. recommendations bring the same kind of disappointment to all my future meals. Note from Staci: The "mystery" fruit is an apricot. Very exotic.